On Wednesday, 02/05/18 there was a forcible attempt to serve court summon on our Leader Sheikh Ibraheem Zakzaky, who as you all know is in custody of the DSS illegally for the past almost two and half years in Abuja. Sheikh Zakzaky declined accepting any court summon, insisting that when he went to court earlier and obtained judgement, the government has not obeyed the judgement. He described as illogical attempts at charging him to court even as the court had ordered for his unconditional release over a year ago, without the government complying with that judgment. He further narrated before the person who brought the summons that, “We were brutally attacked. They opened fire on us, shot us with guns, killing over a thousand including my sons. I was also shot with my wife. I was dragged over the corpses of my sons. We were then brought here and detained. Our bodies were sore all over, riddled with bullets.” How can any sane person turn around and accuse our leader as the aggressor in this case? We demand that the Kaduna State government, led by Mr. Nasir El-Rufai should charge those who summarily killed more than 347 people as admitted by the government for murder and not the victims of the murderous campaigns. It does not have a moral or constitutional right to arraign Sheikh Zakzaky and others for homicide trial when it is not ready to prosecute and bring to justice, also, soldiers who summarily, willfully and atrociously killed hundreds of Nigerians at their pleasure. 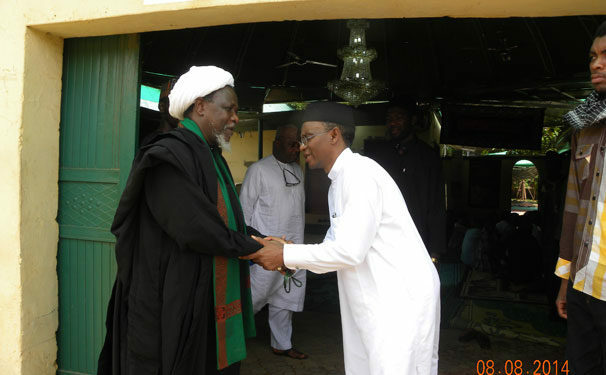 It seems the Kaduna state government has now elevated to an instrument of state policy, the bare-faced social injustice of turning victims of a vicious, brutal murderous aggression into its perpetrators, and treating the aggressors as victims and using the resources of the State and tax payers money to pursue these reprobate discriminatory and recriminatory prosecutions. It is indeed sad that a supposedly democratic government now cherry picks the lives, the rights and the people it is supposed to defend, and those that are, in its opinion expendable. The Islamic Movement takes this odious attempt by the KDSG to arraign our leader, Sheikh Ibraheem Zakzaky on the same charge about 200 are being charge in another court, coming after two and half years with a pinch of salt. As usual, the government has misfired again. The step taken by KDSG is prejudiced, parochial and unconstitutional. This court case makes a mockery of justice and democracy. With the recent public confession by the Saudi crown prince, Muhammad bin Salman, that they are behind the Zaria genocide of December 2015, it remains to be seen when the Buhari administration will have enough courage to admit how much the billionaire prince gave it to execute the Wahhabi murderous plan on innocent Nigerians. We once again wish to reiterate our commitment to continue with our protest in major cities of the country, especially Abuja. If the government feels offended by our protests, then it should do the needful – release the oppressed Sheikh Zakzaky immediately and unconditionally to go and look after his health at least. Also the hundreds still in detention over the Zaria massacre carried out by the army, should also be released, because they are victims of aggression not the aggressors that the government want to deceive the public to believe.